FMA is, at heart, its members. Below is a listing of individuals who have held positions on the FMA Board over the years and who have shaped what FMA is today. This list includes former Academic & Practitioner Directors, Board Members, Conference Chairpersons, Editors, Founders, Publications Committee Chairpersons, Presidents, Secretary/Treasurers, Student Chapter Committee Chairs and Trustees. The president serves as the chief spokesperson for the Association. Upon approval of the FMA Executive Committee, the FMA Nominating Committee automatically places the most recent Vice President in charge of the Program on the ballot as a candidate for President, with the only opposition being for a write-in candidate (FMA By-laws, October 2000). Terms of office begin at the conclusion of the Annual Meeting and conclude at the end of the following year's Annual Meeting, e.g., the 2014-15 term begins at the conclusion of the 2014 Annual Meeting and ends at the conclusion of the 2015 Annual Meeting. The Vice President - Annual Meeting Program determines the type of program to be offered and selects the participants. The Vice President - Annual Meeting Program is an elected position. The Asia/Pacific, European and Latin American Conference Program Chairs typically consist of one (1) Program Chair located in the host city and one (1) or more additional Program Chairs recommended and approved by the Board of Directors. Editors are responsible for their editorial staff and for the contents of their respective publications. Financial Management (FM) was first published in 1970. Financial Practice and Education (FPE) (now the Journal of Applied Finance (JAF) ) was first published in 1990 and retitled as JAF in 1999. The FMA Survey and Synthesis Series is a collection of books addressing timely issues from both academic and practitioner viewpoints and is designed to promote the development of high-quality research that extends the frontier of financial knowledge, as well as the understanding of basic and applied research of financial practices. FMA Online is FMA's online video series. The Secretary/Treasurer manages the financial affairs of the Association and is a member of the Executive Committee. This is an appointed position. Vice President - Financial Education (elected in even-numbered years.) is responsible for developing and administering financial education activities including the development of sessions on financial education for the Annual Meeting program. Vice President - Global Services (elected in odd-numbered years.) is responsible for developing and administering activities to globalize the Association. Vice President - Practitioner Services (appointed position)is responsible for enhancing the value of practitioner membership and promoting interaction between practitioners and academicians. Academic Directors are responsible for representing the needs of FMA’s academic members and are members of the Nominating Committee. 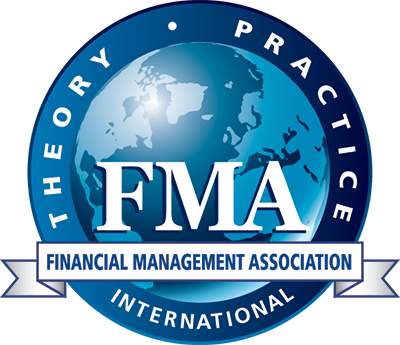 Practitioner Directors are represent the interests of FMA’s practitioner members. Oversees the strategy of the Association's publications and coordinates the efforts of the editors. Trustees are responsible for insuring the long-term continuity of the Association and have the authority to approve appointments or any other matter which appears to affect the basic structure or operation of the Association. The President automatically serves a seven (7) year term as a Trustee immediately following the end of his/her term of office. Two (2) Trustees-at-Large are elected by the Trustees to a five (5) year term of office. The Trustee listing below consist of Trustees-at-Large only. The Chairperson is elected by the Trustees and is a member of the Board of Directors and Executive Committee.